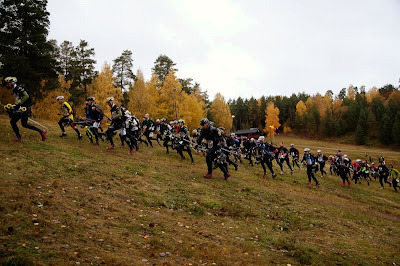 After being asked by Swedish multisporter Martin Flinta to come and race the Swedish Adventure Race Champs (combined this year with the Raid Uppsala) Chris decided that sounded like fun and I decided to tag along too. Fortunately through Aaron I managed to find myself a teammate to race the shorter women's class. So on Thursday we started to get organised with the plan of heading away mid afternoon. By 7 pm when it was dark, cold and raining we were finally ready - we decided to postpone our departure until Friday morning. The drive to Uppsala is pretty long - especially driving on the slow and windy Norwegian roads. We drove over a snowy pass, then down down down until we were on the flatter faster Swedish roads. We stopped to look at a crater formed by an asteroid thousands of years ago. Because my last post had so many snowy pictures, I really feel like I missed showing you how pretty the autumn has been! We have moved into winter so fast it has taken me by surprise. Today was a beautiful crisp sunny day so I wandered down to our lake and took some pictures of the autumn colours before they all drop off into the lake! In some places the edges of the lake are already beginning to freeze. What a pretty spot to live beside, especially when the sun is out! But enough of this pretty photography - we are about to head away on a mission to Uppsala for the Swedish Multisport Champs! After several weeks of cold rainy weather and the odd patch of snow and ice, the autumn holidays are finally upon us. Twiddling our thumbs on Friday night we eventually decided a pleasant walk in the hills was on the menu. So we called on our regular partners in crime - Helen and Ally. Unfortunately Helen was away, but with very little arm twisting (just a hint of the word whiskey) and we had persuaded Ally of the virtues of our plan. By 3 pm we were tootling down the motorway towards Størjdal, then through Selbu and into the bomveg to Vekta. We had very sensibly decided skis would be silly.... this was an autumn trip! However, the white landscape before us suggested otherwise. Snowmobile tracks compacted the snow for the first 50 metres, then it was plodding though knee deep snow with the occasional treacherous swamp hole to watch out for.